Macgyver is everyone hero, he can take a paper clip and two pieces of string and create anything. Truly an inspiration to millions! People are getting more and more creative and finding new ways of using recycled or cheap materials to make accessories for their iphones that serve a valuable function while saving a lot of money. Some of the ideas that people come up with are very useful, while some are just hilarious, but all of them are totally creative! You can easily make a really cool iphone case personalised to your style and it will cost you next to nothing. All you need is a clear cheap iphone 5 case, some bits and pieces of cloth, photographs, pictures and other things that you want in your design and some clear resin. Lay the materials out into a design and stick them on with clear resin. People have been using clear tape to make a cheap, DIY screen protector for their iphone which could be a great idea if done properly. Apparently they get some clear tape, cut it into shape, measure it cut to the sides but leave the length with room to cut down. Then put it in a container of water, and then put it onto the front of the iphone and with a credit card squeeze out the excess water and air bubbles. Then cut the end part with a knife. This one is hilarious but appears to work quite well. Making a speaker amplifier has been done all sorts of different ways, using all sorts of silly and fun materials. One of the best ones is done pretty simply just by using a large Pringles packet. First eat all the Pringles. Then wipe out the inside with a cloth. Then turn iphone music on and put iphone in the bottom. The sound will be amplified! There are heaps of different ideas for DIY iphone stands that make you wonder why people would even bother going to the trouble of buying a real one. The funniest one, that is not very nice to look at, but does the trick, is made using a bunch of pencils and some rubber bands. They are all connected together into what looks like an easel and the phone is rested onto this. Making your own USB charger is pretty easy with a bit of know how, two AA batteries, a mint tin, and a soldering gun. Check online for instructions on how to fuse these things together to create your very own useful USB charger, without needing to spend heaps of money. These babies are an awesome example of how people can do anything, as long as they use their imagination! This post is brought to you by Vistaprint. Connect with Vistaprint on Twitter or Youtube. 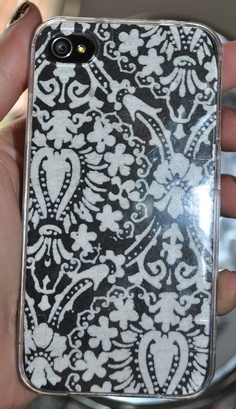 KellieLifestyleiphone, iphone accessories, iphone DIY.